The twelve artists of BLUNT Collective invite the public to a two-day Open Studio event at ACAVA's Limehouse Arts Foundation. This Open Studio brings together new and existing work by the twelve artists of BLUNT: an international and intergenerational collective, whose work is based in different and overlapping perspectives, including queerness, feminism, trauma, carnival/vaudeville and new materialism. 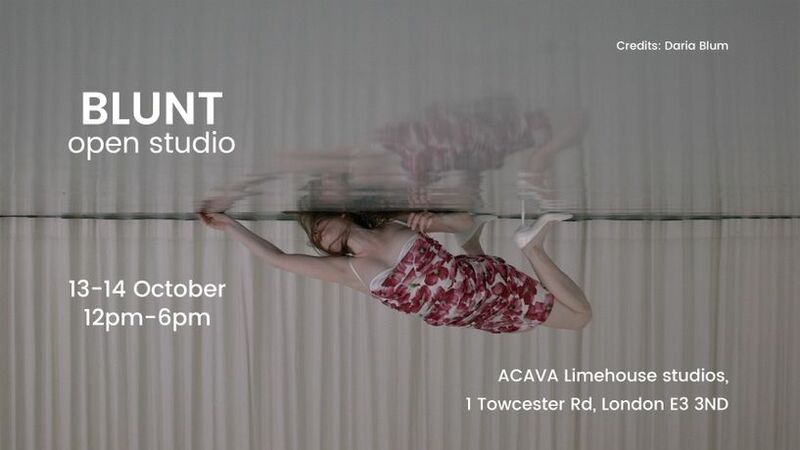 BLUNT respond to the contemporary through questioning assumptions, undermining past narratives and considering new ways of making art using performance, participation, still and moving image, sound, sculpture, body art, drawing, painting, writing and the archive. Daria Blum, Krasimira Butseva, Sarah Carne, Sabrina Fuller, Mark Goldby, M.Lohrum, Margaret Leppard, Davide Meneghello, Andrew Rickett, Mētra Saberova and Jojo Taylor.